This inscription above the doorway on the 19th St. side of 44-56 E. 19th St. / 224-230 Park Avenue South marks the home of the American Lithographic Co. The building is a 13-story loft building constructed in 1895. The American Lithographic Co. had its origins in early American lithographers, among whom were Napoleon Sarony (1821-1896) and Henry B. Major (fl. 1844-54). As summarized at www.artoftheprint.com, "Sarony and Major: Born of English parents in Quebec City, Napoleon Sarony learned lithography from his father and emigrated to New York in 1836. There, he worked as an apprentice for several lithographers, including Nathaniel Currier. In 1846 Sarony opened a lithographic business in partnership with Henry Major. The company went through a number of alterations in names and partnerships. Until 1853, it was called 'Sarony and Major'. From 1853 to 1857, it bore the title, 'Sarony & Company'. From 1857 to 1864, the company name was expanded to, 'Sarony, Major & Knapp'. Later, the company would assume the title of the 'American Lithographic Company', and became the largest such business in North America." The formation of the American Lithographic Co. was announced in The American Art Printer, vol. V, no. 6, January, 1892, p. 162, as follows, "Lithographers Join Hands - It is announced that a lithographers' trust has been formed, consisting of the firms of George S. Harris & Sons, of Philadelphia, Schumacher & Ettlinger, the Knapp Company, F. Heppenheimer's Sons, Geo. H. Buek, and the Giles Company, all of this city. The trust will be known as the American Lithographic Company, and will have an office here. The capital is said to be $12,000,000. The firms included in the trust say that it is too early to make known the terms of the agreement. The object of the trust is not to cut down prices, but to reduce the cost of manufacture. Competition has been so strong of late that several firms have been driven out of business. The firms mentioned manufacture practically all the cigar labels in the country." 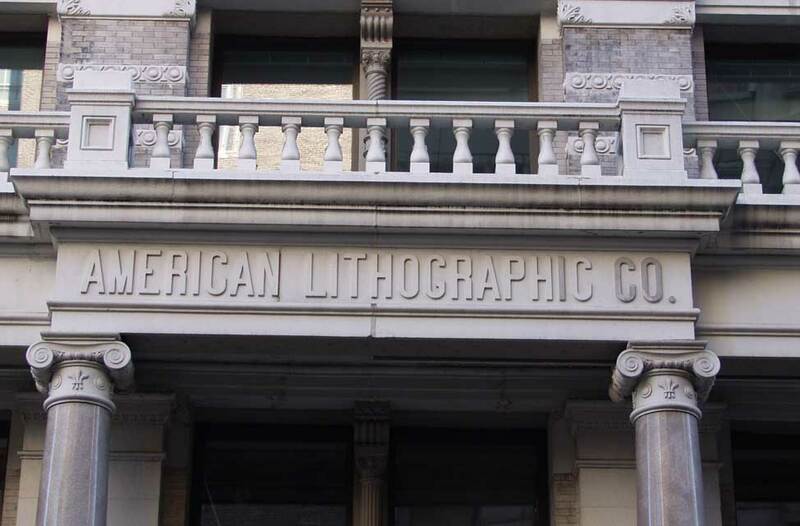 The American Lithographic Co. were located here from 1895 to 1936. Principle among officers during the early years of the company were Leopold C. Schumacher (1849-1914) and Louis Ettlinger (1845-1927). These two were in business as Schumacher & Ettlinger from 1870 to 1895. On his death Leopold Schumacher received the following notice in the New York Times, 8 Sept. 1914, "Leopold C. Schumacher, 64 years old, of 15 North Tenth Avenue, Mount Vernon, died yesterday at his home. Mr. Schumacher was formerly a member of Schumacher & Ettinger [sic], lithographers of this city, and since that company's incorporation as the American Lithographic Company had been a large stockholder in it. He retired from business four years ago." Louis Ettlinger received a longer obituary notice, 24 Jan. 1927, reading, "Louis Ettlinger, Treasurer of the American Lithographic Company, died on Saturday night at his home, 40 East Seventy-third Street, in his eighty-second year. He leaves two daughters, Mrs. Giles Whiting and Mrs. William A. McFadden. Funeral services will be held at 10 A. M. tomorrow in the Madison Avenue Presbyterian Church at Seventy-third Street. The pallbearers will be Joseph P. Knapp, Lucian Oudin. Dr. Fred Whiting and Elliott Daingerfield. Mr. Ettlinger was born in Germany and received his education and early business training there. He came to the United States in 1866 and formed the lithographic firm of Schumacher & Ettlinger, which in 1892 was merged with the new American Lithographic Co. He was a director of the Crowell Publishing Co., publishers of Collier's Weekly, Woman's Home Companion, American Magazine, Farm and Fireside the [sic] The Mentor. He was also chairman of the Board of the Persian Rug Manufactory. Deeply interested in horticulture, Mr. Ettlinger, twenty-five years ago, purchased Boscobel, the Henry Ward Beecher estate in Peekskill, where he made his Summer home and continued the famous preacher's work of transplanting and cultivating trees from foreign countries." Another important figure at American Lithographic was Joseph Palmer Knapp (1864-1951). The following is taken from an outline history at Knotts Island Scrapbook, "JOSEPH PALMER KNAPP was born in Williamsburg Brooklyn NY May 14, 1864. Father: Joseph Fairchild Knapp 1832-1891. Mother: Phoebe Palmer Knapp 1839- 1908. Father was a partner of the lithograph firm Sarony Major & Knapp, Later Major & Knapp, Knapp Co. and a founding member & second president of Metropolitan Life Insurance. Worked at father's firms of Major & Knapp & The Knapp Company and eventually purchased it from father in 1890 naming it the Joseph P Knapp Co in 1891. 1892 Joins Metropolitan Life Insurance Board of Directors. Organized & Headed The First Printing Conglomerate AMERICAN LITHOGRAPHIC COMPANY (ALCO) 1892 - 1929. 1918 Purchases Collier's Weekly Magazine. 1929 Sells American Lithographic Co, but retains ALCO GRAVURE. 1951 At age 86 Joseph Palmer Knapp dies in his sleep on Jan 31, 1951 at his Riverhouse Apt in NYC." This information was posted on an Ancestry.com message board 25 August 2012. The Biographical Dictionary of American Business Leaders, vol. 2 (H-M), 1985, by John N. Ingham, has an extensive article on Joseph F. Knapp, which includes the following about his son, Joseph P. Knapp, "Joseph Palmer Knapp was born in Brooklyn, New York, and educated at Brooklyn Polytechnic Institute. He entered Columbia University in 1880, but dropped out in the following year to go to work for his father's printing company as an apprentice. He rapidly developed his business acumen and began to solicit printing contracts during his lunch hours and after work, with notable results. One of his earliest and most important customers was James B. Duke of North Carolina and the American Tobacco Company. As his sales rose, J. P. Knapp accepted stock in his father's company in lieu of commission, so that by the time of his father's death in 1891, he was able to purchase his father's interest and take control of the business. After 1891 young Knapp began to branch into publishing. From 1891 to 1895 he joined with Duke in publishing a daily newspaper, the New York Recorder, and he enlarged his printing facilities by absorbing about a dozen large competitors to create the American Lithographic Company in 1895." In 1880 the U. S. Census, non-population schedules, recorded the firm of Schumacher & Ettlinger, when they employed 110 hands. Hours in an ordinary day were 9. Skilled mechanics were paid $3.50 per day, ordinary laborers $2.00. They paid $60,000 in wages, and valued the year's production at $180,000. The building at 32-36 Bleecker St., known as the Schumacher, was constructed in 1882-85 for Schumacher & Ettlinger. They were still in business at this location in 1897 (click for ad from the Scientific American from March, 1897). The Annual Report of Factory Inspectors of the State of New York for the year ending 30 Nov. 1899 recorded a total of 857 employees at American Lithographic, 769 males and 88 females. Weekly hours of labor were 53 and 51. This ad for American Lithographic appeared in The Merchants Record and Show Window, vol. XLII, no. 4, April, 1918. In 1937 American Lithographic relocated to the Mills Building at 85 North 3rd St., Williamsburgh, Brooklyn. Plumbers contracted for the American Lithographic Building in 1895 were Donovan Bros., who left their name on a drain in front of the building on 19th Street. For more on the Donovan Bros. see the next page.